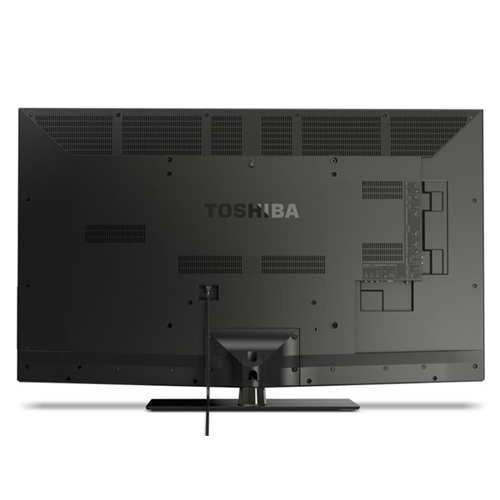 The 46L5200 is a fairly barebones model from Toshiba with 120Hz processing and a standard black framing bezel. It's a nice looking TV with similar features to the 417 model from last year. LED backlighting is edge-lit. It's an economic model with pretty good black levels and brightness for an LED/LCD. The Clear Scan 240 feature (120Hz panel) on this TV works very well to reduce judder and jerky motion. I would say the reduction is around half of what you would see in a 60Hz television. We didnt note too many unwanted ill effects from this feature and its great with sports. Black levels and contrast are not as high as strong as some of the higher end TVs in the market, but they are decently saturated for an LED. Keep the backlight at a moderate setting to avoid running into screen uniformity imbalance especially at the left and right corners of the screen. The DynaLight feature for dynamic backlight control is also included in the 40L5200. This feature moinitors the brightness of each frame on screen and automatically adjusts the pictures backlight intensity according to what it deems is best. It actually works pretty well, but you do notice an occasional flicker when the TV makes adjustments. For purists this will likely be a problem, but you can easily turn the feature off in the menu. Side angle viewing quality is much improved on this TV with contrast and color saturation starting to degrade a little at about 20 degrees off center. Blacks become slightly hazier as well. This is not a bad result compared to many LED Televisions over the last few years. Though it did not calibrate exceptionally well, we felt the color rendition in this TV looked good but over-saturated. If you like a very bright and slightly over-saturated look in your TV viewing this TV may fit the bill well. Overall we felt the picture quality was good. Keeping the backlight in check will keep the screen uniformity issues from popping up on the L5200U. 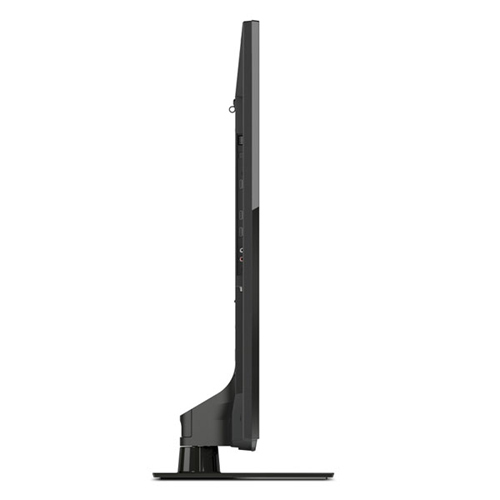 The L5200U lacks Smart TV function and 3D viewing as well as Wifi and Web Browsing. It's a value model for an LED TV. We were originally told this TV would have the new Aero Design with the almost invisible frame, but instead it has about a 1” black piano finish framing bezel. It's a nice enough looking TV – just not as stunning as the Aero design which is similar to the great designs on the LG and Samsung top models. Toshiba has not neglected the speaker system on this TV and include the outsourced Audessey Premium Suite speakers system which delivers much better sound than normal one way speakers. This is a welcome change from our reviews of 2011 Toshiba LED Televisions – where sound quality was sorely lacking. These speakers actually shoot the sound out in two directions. On the L5200 it does not have day and night mode – just one mode but it does give you dynamic volume control. There is a special gaming picture mode on the L5200 which allows faster processing for gaming to help eliminate blur. It works moderately well. Occasionally the L5200 is a little stubborn and slow to respond to commands. Once calibrated though, access is not needed much except adjust the backlight as needed (if you have the Dynalight feature off). The remote has a Quick key to adjust picture settings which is easy to use rather than sifting through the normal picture setting adjustments every time you want to adjust the backlight. Picture mode options are complete with the aforementioned Autoview, Sports, PC, Game, Standard, Movie 1, and Movie 2. 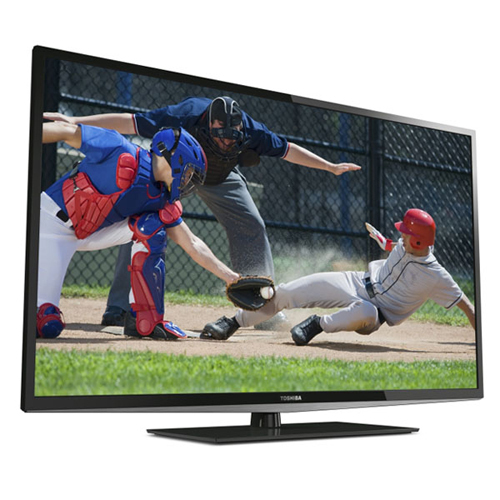 At $799 this is a great value model in the 46/47” sizes range. With pretty decent black levels and a bright very saturated picture and 120Hz this is a good value TV. Sony's KDL-46EX640 has a comparable feature set and picture quality and sells for $200 more. I like the picture quality more on this Toshiba than the comparable Samsung UN46EH6000 model which is $100 more. So this model is very good in the value department for a 46” LED/LCD. There is almost no plasma TV models in this size to compete.